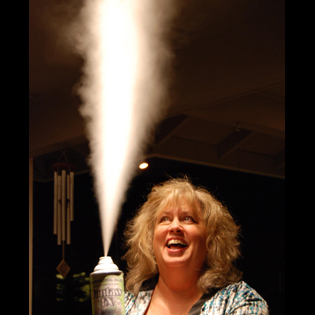 Fantasy FX product is a good solution for a very portable and inexpensive way to offer fog, haze or steam effects without the equipment normally needed to produce these effects. Also known as Smoke in a Can by many of our customers, Fantasy FX safely adds a dreamy or eerie, even atmosphere to a room. The haze will make light beams or laser beams come alive. Used in movies, parties, and laser light shows. Also used by CSI, FBI, CIA, Sheriffs and Police for ballistic visual enhancement of bullet travel.